If you've ever seen a picture of Taylor Swift or Jon Hamm in a magazine, you'll know the outfit they are wearing wearing probably cost in the region of $1-10k. You really, really want to look like Taylor Swift or Jon Hamm, but that's a bit out of your price range. Fortunately, the magazine has your back, and tells you how to buy (almost) the same looks for under $100. We thought it was high time someone did that, but with marketing technology. 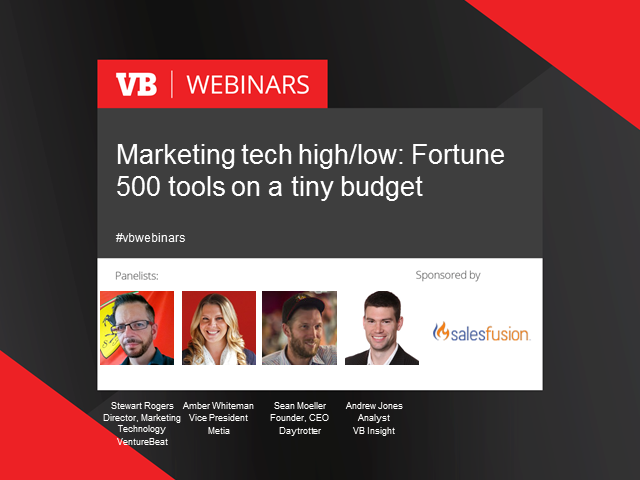 In this webinar, we'll tell you which marketing technologies are most popular among the Fortune 500s of this world, and then explain how to "get the look" for considerably less. Sometimes free. Tune in, and we'll show you how to get Saks Fifth Avenue products for an Old Navy price. This webinar will be an early look at Stewart Rogers' VB Insight report in early January 2016.